Researcher Christine Pollard, director of FORCE Lab. Running shoes are available in dramatically different styles, but how well do various styles protect runners’ hips, knees and feet? 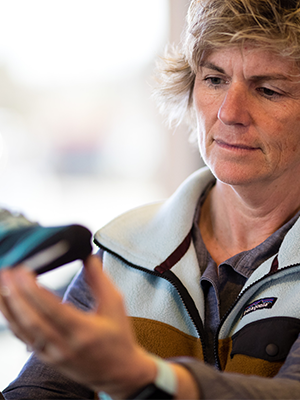 At Oregon State University – Cacades’ next Science Pub, “Biomechanics of Running Shoes: Is there and Ideal Shoe?,” OSU-Cascades researcher Christine Pollard will share results of her recent research on the influence of shoe styles on runners’ limbs. The Science Pub will take place on May 15 at Meadows Lake Restaurant, located at 300 S.W. Meadow Lakes Drive in Prineville. Pollard’s presentation will include a focus on the currently popular minimal and maximal running shoes. Minimal running shoes provide little cushioning, while maximal shoes are highly cushioned. Her findings may help runners determine the best shoe for their running style and anatomy. Pollard is an associate professor of kinesiology at OSU-Cascades, as well as a biomechanist and physical therapist. She is the director of the FORCE Lab, a biomechanics lab, where she oversees research projects related to improving the understanding of lower extremity injuries and advancing injury-prevention and rehabilitation programs. She received a master of science degree in physical therapy from Pacific University and a Ph.D. from the University of Massachusetts in biomechanics. Her post-doctoral work was conducted in the musculoskeletal biomechanics research laboratory at the University of Southern California. OSU-Cascades Science Pubs engage community members in the work underway by Oregon State researchers and scholars from around the state. Science Pubs take place from 5:30 p.m. to 7:30 p.m. Complimentary appetizers and a no-host bar will be available beginning at 5:30 p.m.; the presentation starts at 6:30 p.m. Science Pubs are free to community members, but reservations are required. Space is limited to 100 guests. Register by 5 p.m. the day prior to each Science Pub at http://www.osucascades.edu/sciencepubs.